Our connection with nature is a way in to explore our own true nature and creative potential. I know from experience that time in the natural environment can provide us with the space needed for insight and creativity to surface. 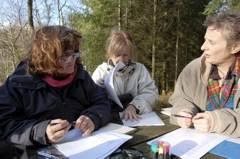 I have developed a branch of my writing facilitation work called “Treading Softly” which combines walking and writing in the natural environment.